The bed would include, not only an electronic weight scale and blood pressure monitor, but also sensors which measure heart rate, breathing rate and body movement while sleeping. In addition, the patient could wear a vest with woven-in electrodes to provide a full electro-cardiogram reading. All this information would be analysed on a PDA and the results sent via a telephone line or broadband connection to doctors. The device, it is claimed, could even provide clues to interrupted sleep by measuring sleep phase patterns. I think these guys need to work harder, because science fiction authors have set the bar pretty high for futuristic hospital beds. SF fans have already seen the hospital bed of the future - and it's a modified military robot. I'm talking, of course, about Roujin Z, shown below taking care of an elderly patient. "Good morning, Man Forrester," said the bed. 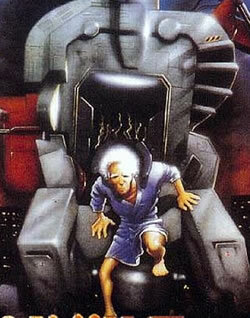 And if we go back just a bit more, Robert Heinlein's original use for the waterbed was as a special bed for patients - the hydraulic bed from Stranger in a Strange Land. From Heart-check beds to be developed via Futurismic.